The amyloidoses are protein-misfolding disorders associated with progressive organ dysfunction. Immunoglobulin light chain is the most common, amyloid A the longest recognized, and transthyretin-associated amyloidosis (ATTR) the most frequent inherited systemic form. Although ATTR, an autosomal-dominant disease, is associated with at least 100 different transthyretin (TTR) mutations, the single amino-acid substitution of methionine for valine at position 30 is the most common mutation. Each variant has a different organ involvement, although clinical differences attributed to environmental and genetic factors exist within the same mutation. Peripheral neuropathy and cardiomyopathy are broadly described, and insights into disease reveal that kidney impairment and proteinuria are also clinical features. This review combines clinical and laboratory findings of renal involvement from the main geographic regions of disease occurrence and for different mutations of TTR. Fifteen nephropathic variants have been described, but the TTR V30M mutation is the best documented. Nephropathy affects patients with late-onset neuropathy, low penetrance in the family, and cardiac dysrhythmias. Microalbuminuria can be the disorder’s first presentation, even before the onset of neuropathy. Amyloid renal deposits commonly occur, even in the absence of urinary abnormalities. The experience with renal replacement therapy is based on hemodialysis, which is associated with poor survival. Because TTR is synthesized mainly in the liver, liver transplantation has been considered an acceptable treatment; simultaneous liver-kidney transplantation is recommended to avoid recurrence of nephropathy. In addition, the kidney-safety profile of new drugs in development may soon be available. Amyloidosis is caused by extracellular deposition of misfolded proteins as insoluble amyloid fibrils that progressively disrupt tissue structure and function. The most common forms of systemic amyloidosis are associated with plasma cell dyscrasias (AL and AH amyloidosis), chronic inflammation (AA amyloidosis), dialysis (β2-microglobulin amyloidosis), age (senile systemic amyloidosis), and inherited gene mutations. Proteins that cause familial forms of amyloidosis are transthyretin (TTR), apolipoprotein-AI, apolipoprotein-AII, gelsolin, fibrinogen Aα-chain, lysozyme, and cystatin C. All except the cystatin C clinically affect the kidney. The recently described leukocyte chemotactic factor 2 (LECT2), which has no evident familial trait, is also included in the nephropathic forms of systemic amyloidosis. Most hereditary amyloidoses are due to TTR mutations. Although kidney deposits were recognized in the original description of the disease (1), a renal phenotype of TTR amyloidosis (ATTR) has been overlooked. This review discusses the effects of ATTR on the kidney, with special attention to the most common mutation, V30M (c.148G>A, p.Val50Met, applying the new nomenclature of the Human Genome Variation Society). The introduction of new therapies will also be reviewed. TTR is one of most abundant circulating proteins belonging to a subset of 25 proteins with a predisposition to misfold. It is synthesized by the liver (90%), retina, pancreas, and choroid plexus as a 55-kD tetramer with four identical 127-residue β-sheet–rich subunits and a 20-residue signal peptide with no specific physiologic properties (2,3). TTR mRNA has been found in kidney cells (4). TTR binds to thyroxine and retinol-binding protein in the blood and cerebrospinal fluid and transports vitamin A without the loss of retinol-binding protein molecules in the kidney (5). The TTR gene is located on human chromosome 18 (18q11.2-q12.1) (6), and more than 100 different single- or double-point mutations and a deletion are described. Pathogenic mutations are associated with the fibrillar conformation of proteins and, subsequently, amyloidosis. Amino acid substitutions result in conformational changes in the protein that lead to weaker subunit interactions between the tetramers. The dissociation into monomers is the first step in the development of amyloidosis. Modified soluble tetramers exposing cryptic epitopes appear to circulate in patients, but the trigger leading to dissociation into monomeric and oligomeric intermediates is not completely understood. Fibrillar deposits are formed only in mid- to late adulthood. This could be because the mechanisms that promote amyloidogenesis become more active with aging or the preventive factors become less effective with increasing age. Nonmutated TTR also forms deposits, suggesting that mutations are not the sole determining factor in amyloid fibril formation and that wild-type (WT) TTR has an intrinsic amyloidogenic property (7). Deposition of WT-TTR results in senile systemic amyloidosis (SSA), whereas its variants or fragments are associated with forms that are transmitted in an autosomal-dominant manner. Some nonpathogenic gene mutations appeared to provide a protective effect with a slower disease progression (8). Because the liver is the main source of circulating TTR, orthotopic liver transplantation (OLT) was proposed for treatment of ATTR (9). ATTR is the most common form of hereditary amyloidosis. This disease was described by Andrade in Portugal (1) and was later reported in Sweden (10) and Japan (11). The initial reports of ATTR emphasized peripheral neuropathy, leading to the term familial amyloidotic polyneuropathy (FAP); that condition affects 1/100,000 people, although this number varies by country (12). In an endemic area of Portugal, the prevalence of ATTR V30M is 1/1000, which is similar to its prevalence in Sweden (13,14). The mutations with predominant heart manifestations include the ATTR I111M and the ATTR V122I, which are present in 3.5% of the African-American population (15). Although the TTR mutation is required for amyloidosis, carriers of the same mutation present variable penetrance. This characteristic suggests that genetic modifiers, epigenetic factors (16), or environmental influence exist. Several candidate genes have been hypothesized but none have been identified (17). On the basis of the finding that penetrance is higher when the disease is maternally inherited, it was recently suggested that a mitochondrial polymorphism might partially explain differences in penetrance (18). Studies on the influence of environmental factors in kidney amyloidosis are contradictory. Renal deposits in transgenic mice expressing the human TTR gene were absent in specific pathogen-free conditions (19) but persisted in other experimental evaluations under the same environment (20). There is a slight male predominance of ATTR V30M, except in nonendemic areas of Japan where women are rarely affected (21). Epidemiologic differences, shown in Table 1, have a special importance in nephropathy (22). Ethnicity and the TTR variant affect organ involvement, although differences exist between patients with the same mutation and within the same family (Table 2). The principal manifestation of most ATTR amyloidosis is peripheral neuropathy with dysautonomia. In the era before OLT, patients died on average 11 years after disease onset (23). The age of onset ranges from 17 to 80 years (12). In Portugal and Japan, disease caused by the ATTR V30M variant usually develops between the third and fourth decades of life. Complement factor C1Q polymorphisms may modulate the age of onset and explain genetic anticipation with amyloid deposition at an earlier age in successive generations (24). In monozygotic twins from Spain, different ages of onset and phenotypes, including dissimilar kidney involvement, have been reported (25). Of note, homozygosity was not described as conferring a worse prognosis of nephropathy in Swedish (26) and Japanese (27) populations. Non-neurologic features include involvement of the heart, eye, gastrointestinal tract, and kidney. A small number of ATTR V30M cases, especially late-onset cases, may present with heart failure (28). Precocious anemia, unrelated to renal manifestations, is conferred by low erythropoietin levels (29,30). It was suggested that the distal nephron is the major site of erythropoietin production in ATTR (31). Much of the literature on renal involvement in ATTR is based on small series. The assessment of different mutations is not homogeneous; some reports specify the clinical manifestations, and others simply describe the presence of renal amyloid deposits. The distribution of amyloid within organs can be demonstrated using 123I conjugated with serum amyloid P component, a glycoprotein present in all amyloid deposits (32). Although scintigraphy with 123I serum amyloid P component can depict extensive amyloid deposits in organs in which they have not been suspected clinically, there is a poor correlation with the severity of organ dysfunction. In addition, this modality is unavailable in most centers (33). The first study dedicated to renal involvement in ATTR V30M was conducted in Sweden (10). Serum creatinine was increased in 5 of the 26 patients examined, and uremia contributed to death in 4 of them. Another study from Sweden, which included 24 patients, showed that half had renal insufficiency and proteinuria (34). Nephropathy did not correlate with age, duration of disease, or severity of neuropathy. In Japan, early manifestation of heavy proteinuria was also identified (35). A Portuguese prospective study (36) involving 22 asymptomatic TTR V30M gene carriers and 32 patients with neuropathy showed that microalbuminuria appears within the third and fifth years of disease and can precede the onset of neuropathy. After microalbuminuria, overt nephropathy developed in half of the patients, usually 2 years later. Renal failure generally occurred 5 years after microalbuminuria, and even sooner in women. The average duration of neuropathy at first dialysis was 10 years. In the pre-OLT era, a serial study involving 403 Portuguese patients from 150 kindreds showed that one third of the patients presented proteinuria and 10% progressed to ESRD (22,37). Proximal tubular syndromes were never assigned to ATTR V30M. The ATTR variants with renal involvement are detailed in Table 2. Proteinuria was not reported in SSA (WT-TTR) or TTR-associated cardiomyopathy. In transgenic mice, WT and variant TTR are present in the kidney in fibrillar and nonfibrillar aggregates (38). In FAP, the deposition of TTR in cell culture in the form of small toxic nonfibrillar aggregates may occur before amyloid formation (39), suggesting that prefibrillar oligomers can cause cell death. Mice with multiple copies of the WT human TTR gene showed nonfibrillar, noncongophilic antihuman TTR-positive deposits in a smooth pattern along the glomerular and tubular basement membranes. Older animals developed dense congophilic amyloid deposits in the glomeruli and focal deposits in the interstitium. Of note, in elderly Swedish patients with SSA (WT-TTR), postmortem analysis revealed minimal congophilic material in the renal cortex, although, as previously mentioned, SSA is not associated with proteinuria (40). Some authors associate weak Congo red staining of the fibrils with delayed disease onset and associate a strong affinity to Congo red with early presentation of the disease (41). In the kidney, staining characteristics of amyloid deposits were not described as being different in cases of early- and late-onset neuropathy. A crucial matter in ATTR nephropathy is recognizing the presence and distribution of renal amyloid deposits. Four studies systematically evaluated the renal histopathology in ATTR V30M. Of those, three were concerned with 14 patients of Portuguese origin each and the other with 13 Japanese cases. In one report, in which half the patients studied had normoalbuminuria, amyloid was found in all cases (42). In another report, which involved only 4 patients with proteinuria, 13 of the 14 patients had amyloid deposits (36). A third study demonstrated the presence of deposits in all patients, even in the 9 in whom proteinuria was absent (43). Finally, in the Japanese cohort, there was evidence of amyloid in 12 cases; proteinuria was verified in 5 of these cases (44). Patients with albuminuria had a more extensive amyloid involvement than those without clinical renal disease. The medulla, basement membrane of distal tubules, loops of Henle, and interstitium are typically filled with amyloid, even in the early stages of the disease. Proximal tubules positively react with anti-TTR antibody inside the cells, which can be sustained by internalization of TTR by megalin (45,46). Renal dysfunction and the degree of proteinuria are correlated with heavy amyloid deposition in the glomeruli, arterioles, and medium vessels, but not with deposition in medullary tissues (42). Renal deposition does not parallel that of myelinated nerve fiber loss in the sural nerve, suggesting that evolution and severity of nephropathy are not correlated with the degree of neuropathy (21,44,47). Amyloid was found predominantly in vessels and tubular basement membrane in ATTR S52P. Detailed pathologic descriptions of other variants are not available. The first case of de novo ATTR in a renal graft was observed in an asymptomatic gene carrier for TTR V30M 13 years after transplantation (Lobato L, unpublished data). In this case, primary GN led to ESRD. Figure 1 shows patterns of amyloid deposition in ATTR amyloidosis. Light microscopy findings in transthyretin-associated amyloidosis (ATTR) showing that amyloid deposition can be found in glomeruli, vasculature, and tubulointerstitium. (A) Massive deposits in the glomerulus, ATTR V30M-amyloidosis, antitransthyretin (TTR) fixation (immunoperoxidase technique; original magnification, ×400). (B) Deposits in the arteriole at the vascular pole–sparing mesangial areas, ATTR V30M-amyloidosis (Congo red; original magnification, ×400). (C) Amyloid in a blood vessel in conjunction with glomerular deposits, ATTR V30M-amyloidosis (Congo red–stained material under polarized light leads to apple-green birefringence; original fixation, ×200). (D) Heavy amyloid infiltration of a blood vessel in ATTR V30M-amyloidosis (Congo red–stained material under polarized light; original fixation, ×400). (E) Congo red positivity in the medullary interstitium, an early lesion in ATTR V30M-amyloidosis (original magnification, ×100). (F) Anti-TTR fixation in the tubular basement membrane, ATTR S52P-amyloidosis (immunoperoxidase technique; original magnification, ×1000). To date, only one published study has evaluated ATTR patients undergoing long-term dialysis (48). This report included 62 patients with ATTR V30M who initiated dialysis at a mean age of 52 years. The main indications for dialysis were fluid overload and metabolic acidosis. Average survival after initiation of hemodialysis was 21 months, with septicemia being the leading cause of death. Decubitus ulcers, followed by catheter sepsis and pneumonia, were the major sources of infections; untreatable hypotension and cachexia were additional causes of death. Symptomatic intradialytic hypotension was present in more than half of all patients and predominated in patients with native arteriovenous fistula thrombosis. In patients who did not survive beyond the first year of dialysis, the absence of a pacemaker represented a two-fold increased risk for death. This observation is probably related to reduced heart rate variability in the face of the combination of amyloidosis with uremia (49). As previously described, when the use of a pacemaker is advisable in patients with amyloidosis, the general recommendations must be followed; however, the threshold for implanting these devices is usually very low, given that other coexisting factors (autonomic neuropathy and hypoalbuminemia) exacerbate episodes of low cardiac output (50). Gastrointestinal disturbances, malnutrition, and physical disability compromise self-peritoneal dialysis care, which requires assisted treatment. Peritoneal dialysis in ATTR is probably a residual treatment, and no sustained experience is reported. The suitability of isolated kidney transplantation is compromised once constant production of the amyloidogenic precursor protein by the liver is maintained. In contrast to other types of hereditary nephropathic amyloidosis, in ATTR this approach was not attempted (51). Currently, there is no specific therapy to remove existing amyloid deposits of any origin. Because the liver is the organ primarily responsible for the production of circulating precursor amyloidogenic protein in ATTR, OLT is performed as a potential curative treatment to eliminate the mutant TTR from plasma (52). In the first descriptions of this treatment, OLT was used to modify neuropathy progression (53). OLT outcomes are not always favorable, and even successful treatments are controversial in terms of nephropathy progression. Scintigraphy with 123I serum amyloid P component showed mobilization of visceral amyloid, namely in the kidney, although mobilization of renal deposits by histology has never been proven (54). Support for de novo amyloid deposition was demonstrated by the type of fibrils extracted from the kidney before OLT (55). The fibrils did not contain obvious WT-TTR; however, after OLT, WT-TTR was evident, in a process similar to that in the heart, although in a less substantial amount. The analysis of fibrils extracted from myocardium tissue after OLT revealed a greatly increased ratio of WT to variant TTR, suggesting that pre-existing amyloid fibrils can induce the formation of rapidly progressive deposits (56). This unique vulnerability of heart tissue for continued deposition of WT-TTR is not understood (57). During the first year after OLT, renal function significantly declined in Swedish patients, with stabilization thereafter (58). Portuguese studies demonstrated that proteinuria may be augmented, occur de novo, or remit. Long-term dialysis was implemented 7 years after OLT, although a substantial gain in survival was possible (59). In one patient, histologic assessment revealed more extensive deposits and interstitial nephritis. Therefore, in the presence of progressive renal insufficiency or proteinuria, a kidney biopsy provides information that is useful for adjusting immunosuppressive therapy and determining whether heavy amyloid deposits are the main cause of ESRD. Japanese researchers recommended renal biopsy to determine the contraindications for liver transplantation (44). In a French study of eight patients who underwent a second renal biopsy 2 years after transplantation, no significant changes in deposits or toxicity due to calcineurin inhibitors were detected (43). Simultaneous liver-kidney transplantation represents a therapy for ESRD and avoids recurrence of nephropathy. The Familial World Transplant Registry reports 32 such transplantations in patients with ATTR V30M and 1 in a patient with Val94Ala; in addition, a patient with Ser77Tyr underwent both liver-kidney transplantation and heart transplantation. In our center, six patients (mean duration of neuropathy, 8 years) had liver-kidney transplantation (60). After 84 months proteinuria had not recurred, but no histologic evaluation was done. The use of FAP livers as allografts for other patients, also known as domino transplantation, has raised concerns about the risk for de novo disease (61). In our center, interstitial amyloidosis in the kidney was also demonstrated 8 years after a domino procedure (Vizcaíno R, unpublished data). New strategies have been developed to treat FAP despite the scarcity of organs and doubts concerning long-term results (62). Several trials, some already completed and others recruiting participants, are evaluating or will evaluate new drugs (Table 3). A decision tree for ATTR amyloidosis is presented in Figure 2. 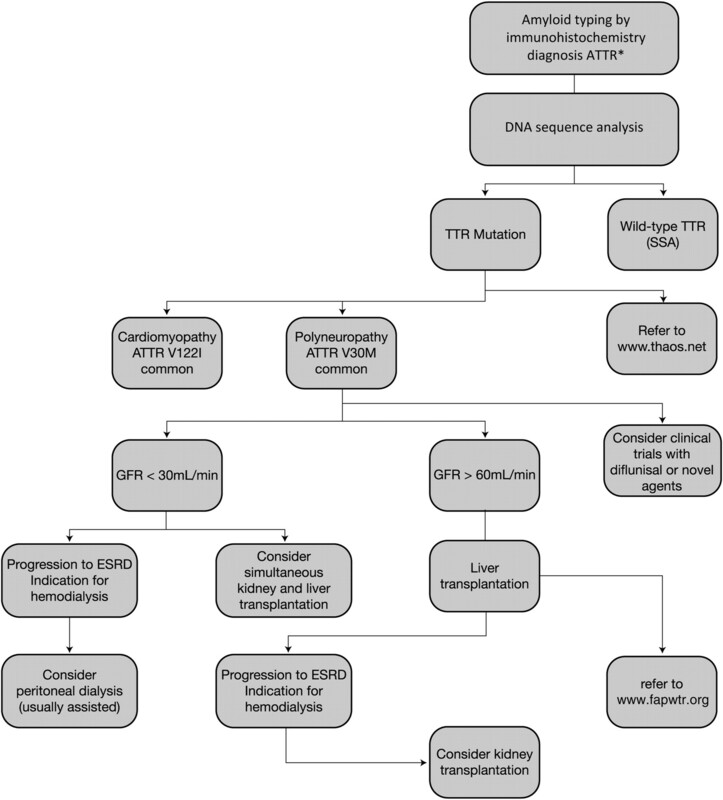 Algorithm of diagnosis, treatment of nephropathy, and general recommendations for transthyretin-associated amyloidosis (ATTR). The results of immunohistochemistry for ATTR can be equivocal and difficult to interpret. Recently, mass spectrometry based on proteomic methods has been applied to subtype amyloidosis. SSA, senile systemic amyloidosis; TTR, transthyretin. In ATTR, the occurrence and onset of nephropathy vary according to the mutation. The possibility of old asymptomatic gene carriers suggests that ATTR nephropathy may be present, regardless of its absence in family history. It is important to suspect ATTR in patients presenting with proteinuria, progressive renal failure, weight loss, peripheral neuropathy, and cardiac dysrhythmias. Urinary biomarkers specific for tubular and interstitial pathologic abnormalities are needed for early detection and timely treatment. Until now, trials did not clarify whether kidney disease is an exclusion criterion for a drug or an option for a particular one. New therapies will highlight important issues for nephrologists and groups devoted to amyloidosis. The authors thank Professor Idalina Beirão from the Department of Nephrology of Hospital de Santo António and Dr. Ramón Vizcaíno from the Department of Pathology of Hospital de Santo António, Porto, Portugal, for collaboration. They thank Eduardo Rothes for manuscript preparation. This work was partially supported by Unidade Multidisciplinar de Investigação Biomédica, Universidade do Porto.